We look forward to a pancake treat on Shrove Tuesday and we than the CSC for coordinating and providing the pancakes for students. Students should eat a regular breakfast and bring a regular lunch. 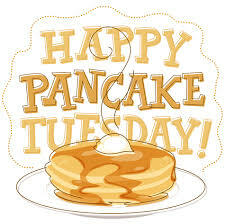 The pancakes are a treat which will be served throughout the morning as a snack. The pancakes have been purchased through Kids Kitchen, so they are nut free. Should your child have a gluten or egg allergy, please speak with your child’s teacher as you may wish to send a different treat for him/her. Thank you CSC members & volunteers!